7 places that make the best falafel in New York City. Falafel is a food that unites us all — it’s gluten-free, enjoyed by vegans and meat-eaters alike, and it’s generally pretty easy on the wallet. With North African and Middle Eastern roots, these chickpea fritters are today beloved by people of all backgrounds, worldwide. As the national dish of Israel, it’s typically enjoyed in fresh pita with various accoutrements like chopped Israeli salad, French fries, amba sauce and pickled cabbage. New York City has dozens of falafel joints to choose from that are all pretty decent. But if you’re looking for that perfectly crisp exterior that encases a soft, flavorful interior, with plenty of interesting sides and fresh salad or pita, here’s a short list of places you’ll love. Plus, can you think of a better way for a New Yorker to honor Israeli Independence Day (coming up May 1) than with the best Israeli falafel in the city? Named for the Hebrew word for sesame seeds, Soomsoom is a falafel place steeped in Israeli tradition. While you are there make sure to try their sabich and their spiralized potato – not to be missed! You can find locations on the Upper West Side and Midtown. Chef Einat Admony opened Taim (Hebrew for “tasty”) to create the kind of casual, friendly falafel shop that she grew up with in Israel, right here in New York City. The owner and chef of Balaboosta, a fine dining restaurant, Admony offers several gourmet touches to her falafel, the sides, and the fresh fruit smoothies: an unexpected herb here, or some Tunisian spices there. This no-frills, family-owned shop has been frying up homemade falafel near Union Square since 1992. Order a falafel sandwich here for under $5 and take it to Union Square for a simple meal in the park. This Syrian-style falafel is made with chickpeas, parsley, fresh garlic, onions and spices, and served in a thin pita with fresh veggies and tahini. Located in the West Village and on the Upper West Side, Hummus Place has all of your favorite Israeli foods and more. When I went there to try the falafel, it was impossible not to also try the hummus, labane and fresh pita, and kataifi for dessert. What started as an innocent falafel trip ended up as a full-out Israeli feast, and I have no regrets about that. This Midtown falafel spot is well known for its pita sandwiches, filled to the brim with falafel, hummus, pickles and vegetable salads. Because it’s kosher and it caters, it’s one of our office’s favorite options for staff meals. Eastwood, a Tel Aviv and Scottish pub-inspired bar on the Lower East Side has it all — classy Mediterranean tile floors, a craft beer bar and a kitchen that serves many delicious dishes — including Israeli Scotch Eggs. That’s right, the falafel has a hard-boiled egg inside. What more could you ask for? This West Village classic has been serving falafel since the 1970s, Mamoun’s is the oldest falafel restaurant in NYC. 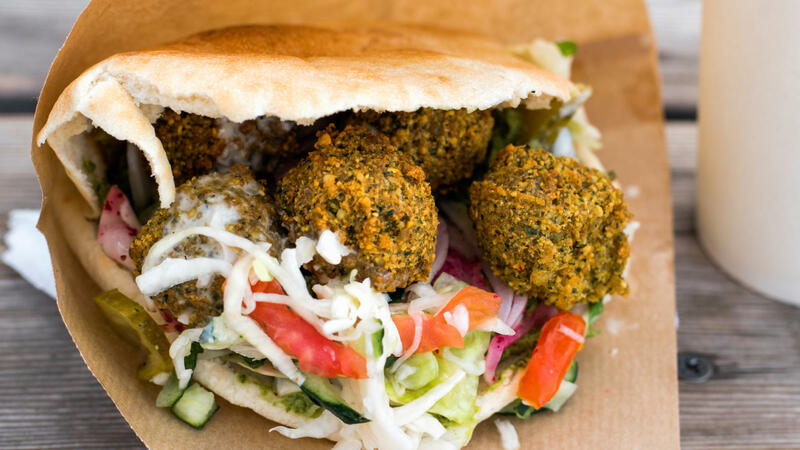 It’s still popular among NYU students, tourists and falafel-lovers alike. Its falafel sandwiches range from $3.50-$4–likely one of the most affordable and satisfying sandwiches in the city. If you want to spend a few more dollars, try its hummus, baba ganoush or baklava.